A salt water flush colon cleanse is a simple and inexpensive way to alleviate constipation and remove toxins. It involves drinking a mixture of natural sea salt and warm water. This type of colon cleanse is recommended if you have chronic constipation or are experiencing irregular bowel movements. The flush is often recommended in conjunction with a juice fast, such as the lemonade diet, or a detox diet. Drinking salt with warm water has a laxative effect, and will usually cause one or more urgent bowel movements within 30-60 minutes. Thus, it is best to do the flush when you are close to a toilet and preferably at home. Add 2 teaspoons of unrefined natural salt (such as Celtic sea salt or Himalayan pink salt) to 4 cups (1 quart) of warm water and thoroughly mix until dissolved. We highly recommended using only filtered or distilled water (rather than unfiltered tap water). Quickly drink the entire mixture on an empty stomach. Most people prefer to do the flush first thing in the morning, but it can be done any time of day if your stomach is empty. The first obvious benefit of the flush is that it does help remove accumulated waste in the colon from constipation, sluggish digestion, or excessive food intake. Salt water helps contract muscles in the intestines that help quickly move waste out of the body. This process can also help clear up other symptoms of constipation, such as bloating, gas, fatigue, headache, body aches, sour stomach, and fluid retention. 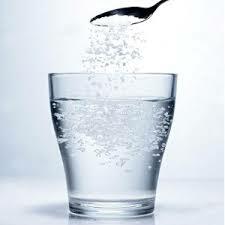 Drinking salt water on an empty stomach may cause nausea or vomiting. In general, doing a salt flush on occasion can be a safe way to cleanse your colon. However, doing it too often can lead to mineral imbalance, which may have other side effects such as dizziness, blood pressure changes, fatigue, and muscle spasm. Any type of colon cleansing can also create changes in the microbiome. Chronic imbalances in the microbiome may lead to an increased risk of colon disorders, according to research in Microbial Ecology in Health and Disease. Thus, I highly recommend taking a probiotic (30 billion culture or more) for several days after doing the salt water flush to replenish the good bacteria that gets flushed out with the cleanse. Drink more clean, filtered water. There is no question that chronic dehydration is the most significant factor in colon toxicity. Eat a plant based diet for a day, a week or longer. Specifically avoid salt, sugar, meat, dairy, and processed food. Eat plenty of whole, fresh foods. There are many natural supplements on the market that are also effective at cleansing the colon, but some of them are too harsh and can cause pain and cramping, such as the laxative herbs senna and cascara sagrada. Other gentler ingredients include aloe vera, slippery elm, triphala and magnesium. One of our favorite colon cleanse products is Oxy-Powder.